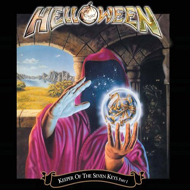 "Keeper of the Seven Keys, Part I"
In the present day, when HELLOWEEN fans argue about the band's continued relevance or lack thereof, and debate which album or era holds the most merit, it's easy to forget the time when this band could absolutely do no wrong. They pretty much wrote the rule book in 1987 with "Keeper of the Seven Keys, Part I", taking influences from QUEEN to MAIDEN to QUEENSRŸCHE and mapping out a blueprint that mere mortals are still slavishly following to this day. And even though a mini-industry within the European music biz has sprung up to handle subsequent generations of power metal, no one has yet nailed it down with the energy, enthusiasm, and creative spark of the classic HELLOWEEN lineup. It's past time for a definitive, remastered reissue of this classic album (and "Keeper… Part 2" as well, which will be covered next week). Bonus material isn't the most impressive — a b-side, a single edit, the sort of tracks already found elsewhere and already in the hands of the obsessive. But even without the extra cuts, just having a good-sounding remaster of the original songs should make any metal fan with a pulse ecstatic. If I may be permitted an old-man moment: you kids with your DRAGONFORCE need to go back to this album and respect the roots. HELLOWEEN took melodic metal to a new standard of aggression and speed here, cranking out fast, double-kick-driven barnstormers with soaring melody in both the vocals (debuting an 18-year-old Michael Kiske behind the microphone) and the guitars (the team of Kai Hansen and Michael Weikath proving to be one of the best combos in the business). The soloing in "I'm Alive" alone is joyous and exuberant, bursting with brash confidence and the kind of world-beating energy that makes the whole album like a shot of caffeine. "Keeper of the Seven Keys, Part I" runs the gamut — from the frenetic "happy HELLOWEEN" sound of "I'm Alive" to bombastic ballad "A Tale That Wasn't Right" to the ultra-catchy "Future World". The centerpiece, though, is of course "Halloween", the fourteen-minute epic that laid out in no uncertain terms the ambitions and creative overload of this band. Defiantly long and meandering (although a butchered five-minute "single edit" was reluctantly agreed to for the USA), "Halloween" was a career-making smorgasbord of riffs and parts, almost decadent in its indulgence, and astonishing in the sheer quality of the whole damn works. "Part 2" may have sold more copies and spawned more recognizable hits ("I Want Out", anyone?) but "Keeper of the Seven Keys, Part I" turned HELLOWEEN from promising indie metal scrappers to hard rock royalty. All was not well behind the scenes, of course, but we didn't know that at the time, and it scarcely matters two decades later — this masterpiece has barely aged, and still holds its own with anything that's come since. Absolutely mandatory metal.